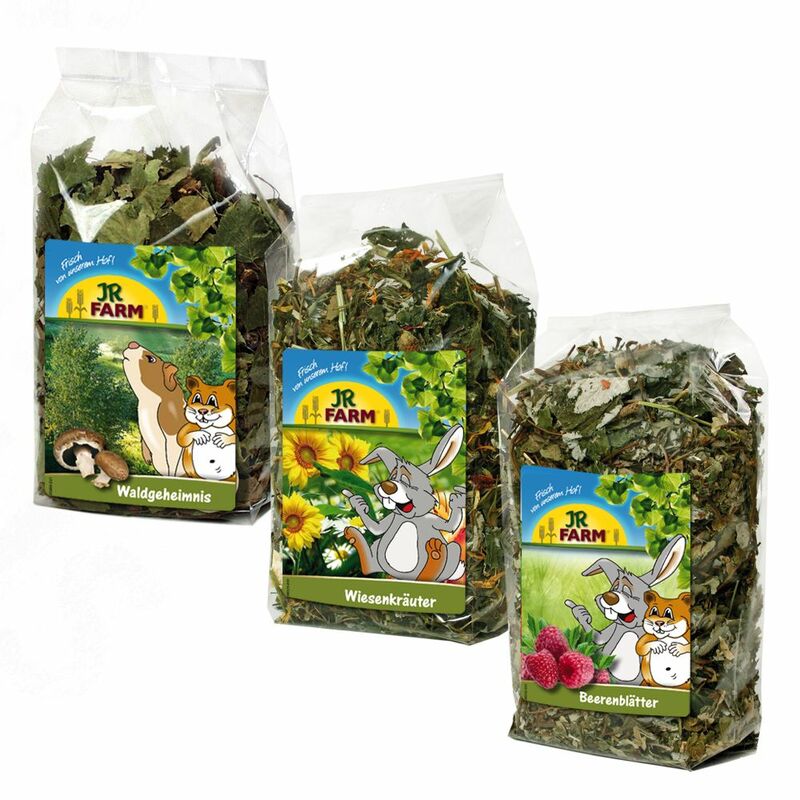 The JR Farm Forest and Meadow Secrets Pack contains three raw feeds for rabbits and small pets. The fragrant graΒes, leaves and herbs are not only tasty, they also have a high fibre content for healthy digestion, boosting their all-round health. A natural change to your pet's regular diet. The healthy JR Farm Forest Secrets crude feed is a selected forest mixture with many minerals and trace elements! With JR Farm Herbs of the Meadow, delicious raw meadow graΒes, herbs and flowers are on the menu. JR Farm Berry Leaves contain fruity leaves from strawberry, blackberry and raspberry plants. These provide a tasty alternative to the usual herbs. The leaves may have small thorns on them but they do not pose a danger to rodents. They also consume thorns in the wild and support your pet's natural diet. The JR Farm Forest and Meadow Secrets Pack at a glance: Contains 3 raw foods: JR Farm Forest s Secret 100g, JR Farm Herbs of the Meadow 150g and JR Farm Berry Leaves 100g Supplementary feed for dwarf rabbits and all small pets High fibre content: can boost the digestion and generally make your pet feel better Wild-like nutrition: select ingredients for a balanced diet that's similar to what they might eat in the wild A special forest blend: with eΒential vitamins and trace elements Meadow graΒes and herbs Fruity leaves from strawberry, blackberry and raspberry plants: a nice change to the regular herbs and graΒes.